1 What Are DCP Profiles and Why Do I Need Them? What Are DCP Profiles and Why Do I Need Them? Technically, each photosite in a digital photography camera's image sensor outputs a certain current based on the number of photons of light that hit that photosite. The current is converted into a number. These numbers, along with some metadata, are stored in what is known as a "raw file". At this point there is no concept of color and the raw data looks nothing like an image. As in traditional photography, the image must be "developed" into a usable form. One of the steps of this development involves translating the numbers into accurate colors, and for that you need to profile the camera, to map the numbers to specific known colors. Practically, you must use an input color profile in order to get accurate colors, and currently the best way to go about this is using a "DNG camera profile" (DCP for short - do not confuse with the entirely unrelated Digital Cinema Package). The input color profile is what makes a camera's colors look they way they do when you open a photo, before you make any tweaks. ICC - These are matrix profiles, tailored only to daylight, not so good in incandescent light. This is the old kind of profile. DCP - These are the new types of profiles. DCP single-illuminant - These are tailored only to daylight. DCP dual-illuminant - These are tailored both to daylight and to incandescent light, so they perform great in most lighting situations. You can create your own DCP profiles tailored to specific lighting situations for ultimate color accuracy. Let's say you are shooting a wedding, or panoramas for a virtual tour. You need accurate and consistent colors. The color spectrum of the light outside the building is completely different to that inside, and even indoors the light will differ between the rooms as general consumer light bulbs produce light of different temperatures and spectrums, and there are usually several different types of light bulbs illuminating a single room. If you come prepared with a color calibration chart, such as the X-Rite ColorChecker Passport, all you need to do is to take a photo of this chart in the same location(s) as your normal photos, one shot per lighting situation (which usually translates to one shot per room and outdoors), then generate DCP profiles from these shots and use them in RawTherapee to achieve correct and consistent colors and white balance between all your shots. The best target for most shooting situations is one which is non-glossy, has good reference measurements, and is portable and rugged. For that reason we recommend the X-Rite ColorChecker Passport Photo. Don't be mislead into thinking that the more patches a target has, the better - that is not the case, and having more patches makes tweaking and producing a high quality DCP more difficult. An example of a perfectly executed target shot. 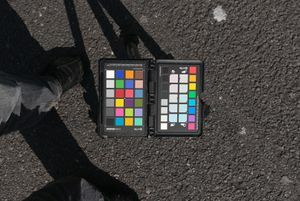 The whole ColorChecker Passport is visible, it is centered and takes about 1/3rd of the frame to avoid vignetting issues, it is perpendicular to the camera, there is no glare from the target as the target and the camera are positioned at a sufficient angle relative to the sun, there is no glare from the background, it was taken on an empty road far away from any reflective surfaces, and it is well exposed with the white patch being close to the right edge of the histogram without clipping (measured in RawTherapee using the neutral profile after picking the white balance off a gray patch). Shoot the color target with the sun relative to you in such a way that there is no glare - no direct sunlight bouncing from the target right into your camera. 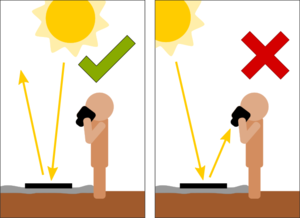 Note that in this incorrectly simplified 2D image the target is not facing the photographer, but in real life you would be positioned perpendicular to its surface. 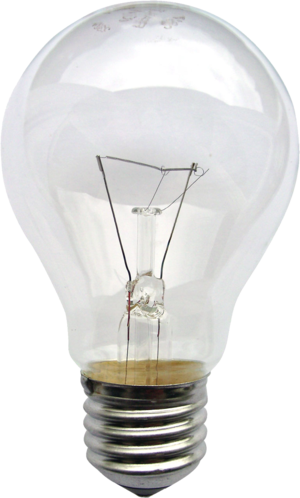 A clear, non-tinted incandescent tungsten light bulb. Use this type of light bulb for your StdA shot. This guide assumes you use the X-Rite ColorChecker Passport, though you can use any supported color target. If using the X-Rite ColorChecker Passport, while it's enough if you shoot just the 24-patch part we do prefer shots of the whole target. Light from a non-tinted incandescent tungsten light bulb, known as Standard Illuminant A, or StdA for short. Daylight, known as Standard Illuminant D, and you should strive for a light between D50 (known as "horizon light") and D65 (known as "noon daylight"). To handle specific lighting situations for yourself only. In the former case, you will want to take extra care to make sure your profile sticks to the requirements because many people will use it. In the latter case, you will probably only use that profile on that specific occasion, and it will be of no use to other people. We need photos taken in both incandescent light and daylight. Ideally, wait for a clear, sunny day when the sun is high above the horizon, near the zenith at midday. You can also photograph the target on a lightly overcast day around noon, but not on a stormy day, in winter, or even in summer in the early morning or evening. You don't want stray colors in the spectrum which appear when the sun is near the horizon or behind heavy clouds or smog. For the daylight shot, find a spot far away from anything that could reflect light. Your balcony is not a good spot - the walls will reflect light and negatively influence the light spectrum, even if you can't see that with your bare eyes. The park is not a good spot. Standing under a transparent roof or sun umbrella is not a good spot. A large, empty-ish parking, far away from walls and trees and parked cars, is a great place. Anything other than clear, direct sunlight is bad. Forget about using a flash. Nothing matches real sunlight. For the incandescent shot, you need a real tungsten light bulb, the kind that were used everywhere until the world moved to compact fluorescent lamps in the last decade. Don't use fluorescent lights - even if they have a warm color, the light spectrum is absolutely different to tungsten. Don't use halogen lights. Don't use tinted bulbs. Position your color target and yourself relative to the source of the light (the sun or the light bulb) in such a way that the light does not bounce directly from the target into your lens as that would cause glare, but also so that it does not come in at an extreme angle. When using a light bulb, to avoid uneven lighting, do not place your target less than 1 meter away from it - 2 meters is a good distance. Ensure that the face of the target is evenly lit and that the light reflecting from the ground and nearby objects does not fall on it. While the sun is far away and you could get away with tilting the color target not-perpendicular to the sun, a light bulb will be close to you and due to the inverse-square law a tilted target could suffer from uneven lighting. Point it towards the light source to guarantee even lighting but in such a way as to avoid glare. Ensure that the background is non-reflective so as to avoid background glare. A tar road or a black cloth work well, white paper does not. Make sure that the photos are sharp. The DCP generation software needs to be able to identify dust and scratches to isolate them, so do not shoot out-of-focus or with motion blur. Use a tripod for the incandescent shot. Position the target so that it fills the center-third of your frame - not more, not less. The center of the frame has the best optics and lowest vignetting. Remove all filters from your lens. Set your aperture to between f/5.6 and f/8. This minimizes vignetting. Shoot at your camera's lowest base ISO, typically ISO100. For the StdA shot don't go above ISO800 - use a tripod. Using ISO100 and f/8, typical exposure times for daylight are about 1/500s and for StdA about 1-5s. Shoot raw (full raw, not "s-Raw" or any other variety). Turn off any camera setting which could influence the raw file, such as long exposure noise reduction. Exposure bracketing is acceptable and even recommended - it will help you/us find the best-exposed shot without clipping. e.g. shoot -1EV/0EV/+1EV. Feel free to send all three bracketed images (or all six - 3 for daylight, 3 for StdA). Rename and/or describe your photos - we don't know what "_DSC1234.DNG" means. Rename them to "MAKE MODEL light.extension" for example "NIKON D810 daylight +2EV.nef". If you're uploading more than one photo, describe how they differ. Let us know where in the world you shot them, e.g. "Bikini Atoll, Marshall Islands". Tell us when your target was manufactured, or at least the year when you bought it. Read each of these points again and make sure your photo conforms to them before uploading. Open a new issue on the RawTherapee GitHub page, upload your raw photos using Filebin and paste a link to them in your new GitHub issue. We are interested only in the raw photos, not in a ready-made DCP - we will make one ourselves. If you bracketed, you can upload a series of each and we will choose the best ones. As above, you will want the color target to fill a third of your frame, f/8, ISO100, sharp, though the points about light do not apply here. If you're shooting at an event at which you will take many photos under the same lighting conditions - business portraits, real estate, a series of images for a 360° panorama in the forest, or a wedding - take a shot of the color target just before (or after) you take your actual photos. There are several ways of creating a DCP. The simplest is using the software that came bundled with the test target. The higher quality and open-source alternative is using DCamProf. Simply install the X-Rite ColorChecker Passport software bundled with your chart (it works in Linux too using wine, just follow the same steps as outlined for installing Adobe DNG Converter in Linux) and open your shot in it. It expects the shot to be in the DNG format, so you should first convert it to DNG. Using it is straightforward, it's intuitive. DCamProf, written by Anders Torger, is a free and open-source command line tool for generating camera profiles and performing tasks related to camera profiles and profiling. Notably, it can generate profiles in both the ICC and DNG formats, and it is capable of generating high quality, smooth LUT profiles from CC24 shots or other targets. The program's homepage has a full list of features and extensive, clear documentation. Use that as your primary source of information. This RawPedia article serves merely as a reference, to exemplify the process of compiling the program (not necessary under Windows and macOS) and using it to create a dual-illuminant DCP profile. Windows and macOS users can download a DCamProf binary and run it. Linux users may need to compile it. Before compiling, make sure you have the required dependencies: LCMS2 and libtiff Compiling is as simple as downloading and uncompressing the source code of the latest version of DCamProf, then going into the folder from a terminal and writing "make". You will also need ArgyllCMS to be installed as we need to use some of its tools. In the example code below, its tools are prepended with "argyll-". This might not be so on your system, e.g. in Gentoo and Sabayon the "scanin" tool executable is called "argyll-scanin" while in Ubuntu its called "scanin". Adjust accordingly. Take two photographs of the color target as described above in the Shooting the color chart section. In the Color Management tool click "Save reference image for profiling", and in the window that appears make sure "Apply white balance" is not checked. Save the one as "daylight.tif" and the other as "tungsten.tif" to the same folder which contains the compiled "dcamprof" executable. It is very important that during the make-dcp step you specify tungsten.json first and daylight.json second! In this example, the output file name is PENTAX K10D.dcp. You must use the name exactly as RawTherapee identifies it. Simply open the StdA or D50/D65 photo in RawTherapee and toggle the "Quick info" panel (shortcut key "i") to see which name RawTherapee identifies your camera as. Your dual-illuminant DCP profile is ready for use. To have RawTherapee automatically use your new DCP, place the DCP file in the dcpprofiles folder. This folder will typically be inside the RawTherapee installation folder in Windows, or in /usr/share/rawtherapee/dcpprofiles/ in Linux and macOS. Alternatively, create a new default PP3 for raw files which uses your new DCP - see Creating processing profiles for general use. Per default DCamProf will smooth the LUT to prioritize smoothness over accuracy. This makes the profile more robust for general-purpose use. If you wish you can control all smoothing parameters manually but it's generally not needed. See DCamProf's documentation for further information. This page was last edited on 4 March 2019, at 21:40.